My council is on Equality Impact Assessment alert. For those who are not aware an Equality Impact Assessment (EIA) is a process by which a local authority, or other public body, assesses the impact of any change in service delivery on the different parts of our community. Often, the local authority will have a template and ask members of staff to think seriously about the impact of each decision on equality based on race, gender, age, socio-economic status, religion, disability and many others. I believe that the assessments were once statutory but now they are primarily used to help local authorities demonstrate that they have considered the full range of equalities impacts of their actions rather than completed as a result of Government diktat. And let us not forget that if the equalities issues are not considered a local authority could find itself facing a judicial review. With the amount of changes taking place at the moment (a 20% reduction in budget will do that to you) and the importance of the EIAs there probably aren’t that many staff who haven’t been asked to join in and contribute to at least one EIA. One of the major challenges when producing an EIA is to find data that enables you to accurately breakdown who uses your service. This data is crucial to ensuring that the service meets the needs of the whole community. Whilst the completion of the EIA is designed to make you challenge your own assumptions, good quality data smacks you in the face and makes you adapt. There are a variety of ways to collect this data but one of the key ways is to collect the data through council questionnaires. Everyone reading this has probably completed the equalities section of a survey at one stage or another. Although the questions are fairly simple they usually take up a side of A4 and can be as lengthy as the rest of the survey/questionnaire. Despite seeming a little lengthy the information is crucial when local authorities are trying to ensure that they don’t break the law and do provide a comprehensive service for the whole community. All this goes to explain why I was slightly surprised by Eric Pickles’ latest Local Government outburst on Friday. At a time when taxpayers are watching their pennies, the last thing councils should be doing is sending out unnecessary and intrusive questionnaires. Local residents shouldn’t be asked to reveal detailed personal information just because they’ve enquired about getting their bins emptied or how to join their local library. Clamping down on such town hall activity will save taxpayers’ money and protect the privacy of residents of all backgrounds. Once again Mr Pickles has done his best to make a good news story an attack on local government and once again the attack is pretty flimsy. Local councils collect this information because it helps them deliver services to diverse communities. They collect the information because it ensures that people are not being excluded or treated differently. They collect the information because it helps them demonstrate to the courts that they are not breaking the law and they collect the information because the law says they should deliver services in an equal way. Is Eric Pickles really saying that the above reasons are not justified? What’s more does he really think that removing the duty to collect them is going to stop local authorities doing something which is patently necessary? Of course he isn’t. As always Mr Pickles was just looking for a cheap headline and using local government as his punchbag/muse. One of these days we’ll write a post praising Eric Pickles policies without being irritated by the surrounding sound-bites and interviews he does when he launches it (see asset registers as an example). These ill thought through rants might get him a headline for a few hours but every time he does so it just saps the tolerance of local government staff and damages the reputation of local authorities unnecessarily. This entry was posted on September 8, 2011 at 5:53 am and is filed under Big P Politics, The future of Local Govt, We love the Council. You can subscribe via RSS 2.0 feed to this post's comments. So long as the Courts still ask to see how evidence of how Councils reach there decisions and this includes consideration of how decisions can affect different groups in society, Councils will probably need to collate social and demographic information about their users. Unlike companies that can simply look after the needs of one niche or a large majority who choose to use their products, Councils have to consider the complex needs of groups and individuals in their area. Again, the semblance of a good point, i.e. are Councils simply ticking a box when asking for information at inappropriate times, has been lost in the delivery. The issue with the Asset register was exactly the same. The map was very interesting and illuminating but perhaps the message could be delivered by someone who hasn’t been described by a colleague as ‘able to start a fight in an empty room’. For me the real issue is not whether or not we collect this information, but whether we do something useful with it. Just ticking boxes and then printing off a few charts is next to useless, and does a disservice to the people who have bothered to provide their personal information. However, if it is properly analysed and thought about then it can start telling stories and can really shape how a project or service develops. If information cannot be made use of then by all means don’t collect it, but most can help in some way if used properly. 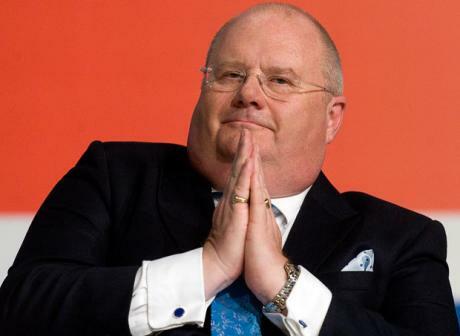 If you really are able to write in praise of Eric Pickles, I look forward to seeing what he does to deserve your praise. In my opinion it’s rather unlikely, though I guess we can all dream. Having trained public sector workers to conduct an EIA, I know they can be time consuming and costly exercises. However, I agree with you, they are also excellent tools in getting local authorities to challenge the way they have consucted their work in the past. They deliver the evidence for the need for change, thus raising the standard of equaltity practices and I applaud the time and effort taken by many to conduct them properly.